Collins Lakeview Forest (CLF) timberlands are managed for sustained yield of high quality forest products consistent with a high level of societal, economic and environmental integrity. Achieve sustained yield of high quality timber across the ownership. Maximize production of all forest products; consistent with sustainability. Provide economic return (benefit) to the stakeholders directly and indirectly involved with the ownership and operations of the lands. Provide leadership to bring about change in local and regional forest management. The timberlands currently managed by the Lakeview operations consist of 62,000 acres in South-central Oregon and 35,000 acres in northern Modoc County, California. This management plan for the privately held Collins Lakeview Forest is based on the stewardship ethics and principles of the Collins Pine Company and the Collins family. This ethic is based upon a commitment to the health of the total forest ecosystem based upon adopted scientific and sustainable forestry and production practices. The production of wood will be only on a sustained, renewable basis; and provide social and economic benefits to the surrounding areas and communities. The plan will be amended regularly; typically every five to ten years as well as when new information, technology and other opportunities become available. The CLF lands are characterized as an eastside pine type. The climate of this type is characterized by a short growing season and minimal summer precipitation. Average annual precipitation is about 16 inches, with much of it falling as winter snow. Diurnal summer temperatures fluctuate widely, with hot days and cold nights. In many areas, frost may occur any night of the year. The months of July, August and September are very dry, with rainfall averaging less than 1/2 inch. Much of this summer rain is ineffective, as it usually comes during brief, high-intensity convection storms. Winter temperatures are generally low; as a result, snow often accumulates to considerable depths. Logging, bark beetles, root diseases and fire are the major disturbances in the eastside pine type. The understory typical of the specific site increases following disturbance, depending on the nature of the disturbance, season in which it occurred and weather patterns. In general, disturbance favors brush, particularly manzanita and ceanothus. But some kinds of disturbance may eliminate antelope bitterbrush, a desirable deer forage plant that may not be as robust a competitor with trees as are some other shrubs. Open tree stands generally support more vigorous brush or grass understories which may prevent additional tree regeneration for many years. Fire tends to maintain pine stands on sites that will support other conifers. 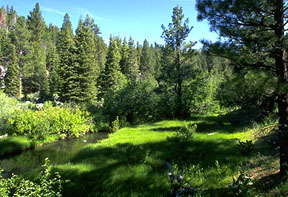 The following understory dominants may be used to identify different eastside pine communities: western juniper, manzanita, several species of ceanothus, big sagebrush, antelope bitterbrush, grass dominance and forb dominance. The main plant association in this area is the Pinus ponderosa/Purshia tridentata association which has a Purshia dominated shrub layer superimposed on a variety of perennial grasses including Festuca idahoensis, Caespitose agropyron spicatum, Stipa comata and Aristida longiseta. In some stands, forbs such as Balsamorhiza sagittata and Erigeron compositus are abundant. Eastside pine is moderately slow growing and long-lived. The time required for succession varies greatly depending on site, competition and seed source. The more severe sites within the type impose problems of reproduction and competition, so that stands may not necessarily reproduce themselves after disturbance, being replaced instead by forbs, grasses, brush or junipers. The soils in this area include areas of immature regosolic soils. These Vitrandepts are developed in deposits of dacitic and rhyolitic pumice erupted from Mount Mazama (Crater Lake) and Newberry Crater, respectively. Thin A horizons have moderate to low organic matter content and grade into relatively un-weathered pumice sand and gravel. A finer texture buried soil is generally encountered at 0.5 to 3 meters. The predominant commercial species on the lands are ponderosa pine (Pinus ponderosa) and white fir (Abies concolor) with minor amounts of sugar pine (Pinus lambertiana), western white pine (Pinus monticola), lodgepole pine (Pinus contorta) and incense cedar (Calocedrus decurrens). Non-Commercial tree species include aspen (Populus tremuloides) and western juniper (Juniperus occidentalis). Brush species include minor amounts of Klamath plum (Prunus subcordata), snowbrush (Ceanothus velutinus), squawcarpet (Ceanothus prostratus), mountain mahogany (Cercocarpus ledifolus), big sagebrush (Artemisia tridentata) and gray rabbitbrush (Chrysothamnus nauseosus). The following table is a list of the major tracts of land and an estimate of forested and non-forested acres of each tract. Approximately 95 percent of the adjacent landownership is federal, with the majority of that being the US Forest Service. The Modoc tract has suffered from two devastating wildfire over the past ten years. The first, Fletcher fire, consumed over 4,000 acres of timberland. This area has been harvested and replanted. Eight years after the replanting efforts many of the trees are over 14 feet tall. The other wildfire that has had a substantial impact on the Modoc tract was the 2012 Barry Point fire. This fire alone consumed over 20,000 acres in Modoc County California and over 3,000 in Lake County Oregon. This area has been salvage harvested and now is in the initial stages of a large reforestation effort. This effort will plant upward of four million seedlings on the areas that were burned. The management tracts which comprise the CLF lands in southeast Oregon and northeast California differ considerably in their structure and composition. While similar in that all three are associated with the eastside pine type, each has very distinct characteristics specific to themselves. These characteristics have developed over time based largely on harvest practices of prior owners, natural occurrences such as fire or lack of, and climatic events such as prolonged drought. As a result of the unique nature of each tract, each has specific and often different management needs. No single vegetation management method or silvicultural system can be applied to our lands on a broad landscape level. Further, some of these same past natural occurrences continue to change the face of the FMU and the management systems that should be applied to them. While the emphasis is on the use of uneven-age system, wherever applicable to promote sustainability and health of our forest resources, the even-age system will be evaluated and utilized, as necessary, consistent with sustainability. Thinnings are employed throughout Collins Lakeview Forest. Use and definition of thinnings is individual tree selection where the timber is removed either as single scattered trees or, more often, in small groups if necessary to ensure that enough trees of needed age classes are free to grow. This silvicultural practice is employed on the majority of the ground, through pre-commercial and commercial thinnings. This is the best way to approach the management of the pine/fir forest type. The objective in thinning stands is to reduce the basal area to the range of 40 to 80 ft2 Basal Area/Acre. Growth data taken from all of the CLF tracts, as well as growth information included in the Fremont-Winema National Forest’s Forest Plan is basis for this basal area range. By leaving the stands in this condition, the canopy will be opened up for light to infiltrate to the forest floor, reduce the competition for water (the most limiting resource in this area) and transfer the stand growth to the remaining trees. Fire suppression over the past 75 years as well as some past harvest practices has promoted, in general, a condition in which two or three age or size classes exist on much of the land base. Additionally, many acres have upwards of 500 stems per acre of 3-5 inch dbh (diameter at breast height) trees. Along with this heavily stocked condition, establishment of the tolerant white fir has been prolific. Stands which were once predominately ponderosa pine are now equally mixed and sometimes over-run by white fir. White fir, while being shade tolerant, is not drought tolerant and therefore extremely susceptible to mortality brought about by stress related to drought and the ensuing fir engraver beetle (Scolytus ventralis) infestations. Further, the heavily stocked condition has made an adverse impact upon the ponderosa pine. Incidence of vigor-related problems such as a decrease in growth, bark beetle infestation and dwarf mistletoe infections have been observed. Each of these individual problem areas can impact a wide and many times different range of age and size classes. Because of this, uneven-age management systems give a better tool to manage for a diversity of size and age classes, as well as to better promote healthy, vigorous stands by harvesting trees single or groups of diseased stagnant trees. Very few of the CLF acres can be classified as true all-aged forests in which three or more well defined age classes (“well defined” means differing in total height and age, not just in stem diameter) are represented and mixed throughout the lands. More commonly, uneven-age stands fall into two general categories. The first is the forest composed of small and irregular groups of more or less even-aged stands. These stands, ranging from 10 to 60 acres in size, are in general even-aged. Trees tend to occur in one acre, or smaller, clumps composed of one to three age classes. These groups are not often clearly separated and sometimes intermixed, but in reality the majority of the trees are not growing under all-aged conditions. The second category is one in which a mosaic pattern of easily distinguishable even-age stands exists. Over areas as large as 100 acres, all age classes and sizes are well represented, but the trees mainly grow in even-aged clumps. The degree of this even- aged condition is not as marked or noticeable as that found in a true even-aged condition. The FMU is faced with indeterminate natural regeneration in the favored (economic and biological) ponderosa pine species, as well as a marked deficit in some diameter classes and surplus in others. When combined with the climatic fluctuations, and insect infestations and diseases that are encountered, utilizing uneven-age management is the best option for creating and maintaining sustainable forests. This will be accomplished on a case by case basis using modified selection cuts, intermediate cuts and/or variable retention cuts which may require use of herbicides to prepare the site for regeneration. Growth and yield of the forest is calculated using the latest distance dependent growth model developed by Dr. Jim Arney of Forest Biometrics Research Institute. This software represents the state of the art in forest inventory database design, area and volume computations, growth projections and harvest planning. It is the result of thirty years of continuing research and development into the quantification and forecasting of Northwest forest resources. This program not only models the growth of the forest, but integral to the system is a method to project out at any time period to estimate inventory, but to also apply silvicultural regimes that are consistent with our management and determine what the annual harvest will be over the time projection period. This model design projects the stand clumpiness throughout the life of the stand. This degree of clumpiness from past management practices and natural regeneration may cause future yield difference of 20-50% when compared to other growth model architectures not capable of handling these stand structures. Only FPS provides small tree growth projections for trees from 1 to 20 feet, including optional treatments of site prep, brush control and animal control. Stands are inventoried after harvesting and this information is then used to update the inventory of the tract. Optionally, additional cruise plots can be taken in non harvested stands to continually update the forest inventory. Our wildlife management goals will strive for species richness management. This implies maintaining habitats that will support viable populations of all the species indigenous to the management unit, as well as those of desirable introduced species. Since there is the potential of several hundred wildlife species within a single forest management unit, addressing the individual habitat needs of all these is impractical. Therefore some procedure is necessary to meet the management objective in a practical manner. To do this, the assumption must be made that meeting the habitat requirements of a small number of carefully selected species (Also known as indicator species are those having a narrow range of ecological tolerance. Therefore, the presence of these species and their relative abundance serve as a barometer of ecological conditions within a management unit.) will assure meeting the habitat requirements for the remaining species. Through consultations with federal, state and private wildlife biologists, a mix of early and late forest succession habitat will be maintained as well as to ensure the proper components of habitat for species selected for management required to maintain a minimum viable population. In addition provide special and unique habitat features, including riparian zones, old growth timber, edge, dead and down woody material, and manage cliffs, caves, talus and road use to provide species richness, and to emphasize habitat conditions for a single or several species selected by the Resource Department for emphasis, on a sustained yield basis. (see Field Application, Wildlife and Riparian areas for current methods of protecting and enhancing wildlife and riparian attributes). Most of the terrain within the CLF ownership lends itself well to mechanized ground based harvesting equipment. The majority of harvesting operations are fully mechanized. That is, rather than having timber fallers and choker setters, the felling and skidding operations are done by machine. Benefits derived from mechanical harvesting are cost savings by the contractor and forest floor fuel loading. The cost efficiency comes from the ability of the feller buncher to bunch the felled trees into piles or turns of logs, to be taken to the landing. Additional, benefits derived from mechanization is the reduction of exposure to the workers on the ground to falling trees or flying debris in the felling process. With the use of grapple machines for skidding the logs to the landing, the elimination of choker setter has occurred. Even though the advent of mechanical harvesting equipment has meant the loss of some jobs in the woods, overall it has improved the safety of the remaining workers. Additionally, with the use of mechanical harvesters, which can direct the path of the fall of the tree, stand damage is reduced over the use of hand fallers since tree direction is controlled by the machine operator and the turns of logs are bunched rather than scattered. As all of CLF’s has been actively managed for over 50 years, the ownership contains road that were constructed to facilitate harvesting and fire suppression activities. Road are evaluated for maintenance prior to management activities requiring their use. Inspections, maintenance and improvements sustain the transportation system in proper working order. Dying, dead and down trees are important components of forest ecosystems, because during the process of death and decay they are inhabited by an extraordinarily diverse succession of organisms ranging from woodpeckers and other cavity-users, to myriad invertebrates, fungi, and microorganisms. Not only are dead trees critical microhabitats for many species, but they are also large reservoirs of organic matter and hence play a role in nutrient cycling. There are alternatives, such as killing trees to meet immediate needs, or providing nest boxes, but allowing a few large, old trees to die naturally is preferable under most circumstances. Habitat conditions for viable populations of snag-dependent species will be provided by meeting the snag requirement targets of 1.5 snags per 20 acres with DBH of 15 to 24” and 0.5 snags per 40 acres with DBH > 24”. As dictated by natural diversity, snag requirements cannot be met on every acre. To the extent possible, the area of accountability will be the timber stand; all forested lands within each stand will be used to assess average snag densities. Twenty feet is the minimum height for snags. The Resource Manager and Lands Manager are both trained in archaeological site detection/determination in California. Although Oregon has no requirements through the Forest Practice Rules to survey for archaeological sites, requirements are exceeded by applying the same training we have received for California and applying it to Oregon operations. When laying out harvesting areas, the protocols learned through the CLFA training in archaeological identification will be employed. If and when archaeological sites are discovered upon CLF lands, there are three criteria that the site must past to determine its significance: The site’s age, the site’s uniqueness and how intact the site is. Obviously, the greater any given archaeological site’s age, uniqueness or intactness (integrity), the more likely it is to be significant and the reverse is true as well. Archaeological site significance can only be assessed on a comparative basis: typical units of reference are all sites within a given harvest area/THP, drainage, county or part of the state. The application of the three criteria allows specific archaeological sites to be evaluated as to their relative significance, or ranked. Such ranking, on a comparative scale from 1 to 10, with 10 being the most significant, is achieved by comparing each site with its neighboring archaeological sites. The relative significance (ranking) of each site then dictated the protection measures most applicable for it. If a significant site is found during the preparation of a THP, or during active operations on a THP, or on harvest operations in Oregon, mitigation for protection of the site will be avoidance. It has been the policy of the Collins Lakeview Forest, to have the lands open to public use. However, there are some lands that are gated. This is because of the improvements and natural resources behind these gates that we must protect. Hunting, mushroom gathering, wood cutting and general strolling through our property is allowed. We do not allow camp fires or fireworks to be used on the property. CLF has and will continue to support research on various aspects of forest ecosystems. In the past we have allowed federal and state employees to collect data upon our land. This type of participation maintains lines of communication between CLF and the research community as well as providing CLF with up to date information which ultimately improves the overall management of the CLF lands. It is the policy of CLF to treat all contract labor organizations equally in accord with the Fair Labor Standards Act. All contractors are required to carry, and show proof of, Workman’s Compensation Insurance on all employees, as well as Logger’s Broad Form Liability Insurance. Operators are trained in hazardous spill containment. Any contractor utilizing migrant or seasonal labor must do so under the direction of the Migrant and Seasonal Agricultural Worker Protection Act (29USC 1801- 1872; 5CFR 500). Where applicable, contractors are required to show proof of valid Oregon Farm/Forest Labor Contractor License throughout the duration of operation on CLF lands. CLF uses independent logging contractors to harvest timber products from the CLF lands and USFS timber sale purchases. Payment to the contractor is based upon production in thousand board feet (MBF) of logs or tons of pulpwood. Road builders are paid on both hourly and project basis. Tree planting or thinning projects will use both piece and acres as the basis for treatment and payment. If any safety issue is noted during field inspection of operations, the safety issue will be brought to the immediate attention of the person involved. All operators are required and expected to follow Occupational Safety and Health Standards (OSHA). Safety of a general nature will be addressed during the Annual Operations Meeting prior to commencement of operations each spring. CLF will continually strive to instill pride of ownership in our contractors as it pertains to projects they perform on CLF lands. Through monitoring of the operations and feedback to the contractors as to how they are doing, as well as their feedback to CLF staff on the operational feasibility of the layout of the harvest area, allows us to plan future operations consistent with resource protection and sustainability. Management zones are areas where wildlife habitat, water quality protection, old growth character, aesthetics and recreation take precedence over timber management objectives. For example, riparian wetland areas play a significant role in restoring and maintaining the chemical, physical and biological integrity of the water resource coming from the forest. Wildlife use riparian areas disproportionately more than any other type of habitat. In addition, riparian areas are highly prized for their economic values and other uses such as livestock production and recreation. Therefore, their protection is for more than aesthetics due to the diversity of non-commodity items they produce. Two broad categories of management zones currently are employed on the ground: Riparian zones and special areas. Riparian zones are defined as designated stream corridors including flood plains, associated wetlands and adjacent forested lowlands. These zones meet the FSC Pacific Coast Standards for buffering classified watercourses. Our objectives in designating and maintaining these management zones is for the following reasons: protection of water quality; protection of associated wetlands and their aquatic habitats; dissipate energies associated with wind and wave action; and overland flow from adjacent sites, thereby reducing erosion and improving water quality; filter sediment and aid floodplain development; improve flood-water retention and ground- water recharge; develop root masses that stabilize islands and bank features against cutting action; restrict water percolation; develop diverse pooling characteristics to provide the habitat and water depth, duration, and temperature necessary for fish production, water bird breeding, and other uses; and support greater biodiversity. Identifying Special Management Resources has been conducted across the ownership and is an on-going process. A special management resource is considered one, which is not typical of its surrounding environment, or exhibits a uniqueness or character of its own. The goal for a special management resource once identified is to protect, enhance, or maintain the specific species and attributes of the area for educational, research, and aesthetic purposes. Usually these are areas of unique hydrologic and geologic features or containing unique plant communities, which will be protected during all land management activities. FSC has classified these areas as either High Conservation Value Forests (HCVF) or Representative Sample Areas (RSA). In association with State and Federal protections for listed species the HCVF and RSA classification process assist Collins Lakeview Forest in identify and protect Rare, Threatened and Endangered species and habit. Currently, one HCV3 and two RSAs have been identified. Current management associate with the RSAs will be passive but include monitoring overtime to evaluate change. Management within the HCV3 will be limited to activities that maintain the resources the necessitated the classification as an HCV3. All lands managed on the CLF have been assessed for the occurrence of HCVs and RSAs. CLF will be reassessed at a minimum once every 10 years to determine if new science or population dynamics are available that would cause portions of our lands to be reclassified as and HCV or RSA. All new land acquisitions will be assessed to under the CLF protocol for selection of HCVs and RSAs. The other type of management zones that are managed for is special areas. These are areas consisting of one or more of the following characteristics: forest cover types and plant populations; wildlife habitat and animal populations; recreation and cultural sites; unique physical or geological features and scenic corridors. The unique characteristics of these areas which could be adversely impacted by timber harvesting are protected. Operations will only occur within these special areas under the following conditions: to enhance the overall wildlife habitat; to meet specific habitat needs of unique wildlife and plant populations; to improve and protect access to the area; to salvage blow down or dead and dying timber. Individual project plans will be developed for each management area. Site specific plans should protect and enhance the unique features. Prior to any timber harvesting activity, these areas will be designated on the ground, mapped and discussed with the contractor before any operations commence. Island reserves and special management areas will be mapped and entered into a GIS with new areas added as they are established. Active management activities within the RSA/HCVs on the FMU may include the following: Removal of encroaching conifers on aspen stands. The techniques employed may include heavy equipment, hand thinning or mechanical mastication.